Kate seems to have had this custom made, based on a design from an earlier year. 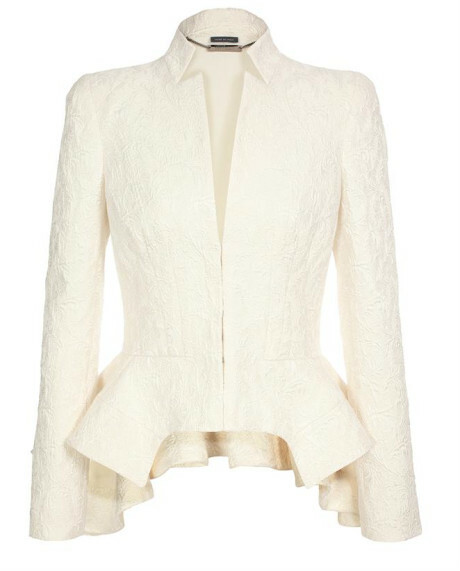 The jacket is a significantly toned-down version of McQueen's earlier "Silk Cotton Jacquard Peplum" jacket. The fabric of the suit is an icy blue and champagne, and unusually, includes the McQueen skulls, barely visible in the pattern. The original piece was described: "Snow white fauna silk-cotton jacquard jacket with exaggerated peplum by Alexander McQueen. Short stand-up collar with thin V neckline. Long sleeves with four button cuffs. Concealed hook and eye closure. Peplum with cut-out front and pleated back. Darted front and back. Structural shoulder pads. Full silk-blend lining. Close tailored fit." The retail was: $4,008.